On my first day as an intern, the first thing that struck me when I entered the SocialCops office were the oddly-positioned black and white photos with seemingly nonsensical captions on one of the walls. I was wondering whether this was some kind of voodoo thing until my attention was diverted by Vikas, who was telling me about what my role as an intern is. I couldn’t not pay attention to that. Well, it turns out that every new employee at SocialCops is given a nickname – ranging from “Angry Young Man” for Varun Banka, and “Mama’s Big Boy” for Ashwin Ravichandran. They were oddly positioned because they were arranged in chronological order of joining and according to the person’s height. So much for my voodoo theory. Let’s rewind a little. 2 days before I started at SocialCops, I was an intern at Chai Point (you could call it a chain of tea stores expanding in Delhi). My work wasn’t challenging. I had a nice enough boss, but we didn’t work for more than a couple hours a day, and none of that work seemed important to the company. So I’m extremely glad I met SocialCops (shoutout to Rahul Meena). As a business team intern, I pretty much dove into whatever they were doing. My role covered marketing, partnerships, research, and every other business-development-related thing you can think of. From figuring out ways to promote ourselves through Slideshare and Quora to researching on which companies would be best to partner with for generating scale in our projects, we were doing it all. I was extremely fortunate to have exposure to such a diverse spread of work, and I’m really grateful to my colleagues for mentoring me and helping pull me up whenever I got stuck. Prukalpa is honestly the greatest, most conscientious boss you can work with, and I’d strongly recommend anyone reading this to see if you fit into any of the roles open at SocialCops. Every Monday, we have a meeting where we set weekly goals for ourselves called OKRs. While I never achieved any of my OKRs – it is said that if you are able to achieve an OKR, then you set it too low – setting them helped give direction to my work week and made me more efficient overall. I still use OKRs now for personal tasks, and I still never achieve any of them! At SocialCops, we aren’t expected to show that we’re working all the time. Everyone has a natural rhythm after all. Personally, I work better in stretches of focus rather than hours of just sitting in front of a computer. The office had plenty of toys to keep me occupied. We have a Parrot Drone, Raspberry Pi, Google Glass, a Playstation and free WiFi. We even have a dartboard, smiley balls, and a thermocol spaceship for when we’re in the analog mood. Something for everyone! There was never an unstimulating moment at SocialCops, even for an intern. When we aren’t dodging bullets (of the Nerf kind), we can be found distributing gyaan on anything from the Young India Fellowship to which where to find the best beef in Delhi. Our office is foodie heaven. Every time we go out on an office dinner (I’m making them sound fancier than they actually are), a lot of time is wasted spent making sure we go to an interesting place. I’d recommend any Delhiites reading this to check out Ivy and Bean, this lovely joint in Shahpur Jat. Oh, and while we’re talking about food… I may be a pretty decent cook, but I’ll probably never be able to make Prateek’s cheese maggi. One of the highlights of the life here – for interns and full time employee alike – was the out-of-office day we had one Friday. The entire business team worked from Social Offline in Hauz Khas Village. Though Prukalpa and Vikas were sick of the music by 3 o’clock (I guess it wasn’t as good as the tech team’s playlist back in office! ), it was quite fun working with a view of the Hauz Khas lake and Deer Park! As the summer came to an end and all interns started saying goodbye, the entire team came together to give us feedback – personally as well as professionally. When I reflect back on my internship experience, this feedback was one of the most important learnings I could get, as it helped give me perspective on myself and on my work. While it’s definitely not for everyone, working at a startup is an incredible experience that I’d suggest you consider having. I don’t believe I would have got the depth of exposure that I got here had I done one of the “right” internship experiences at a big consulting firm. Plus I probably would’ve gotten bored out of my mind on such an internship. I can’t imagine a way I could’ve had more fun or had better exposure this summer. I’ve met the most amazing people and made great friends. I’m incredibly grateful especially to Prukalpa and Vikas for taking the time out to give me advice and mentor me. 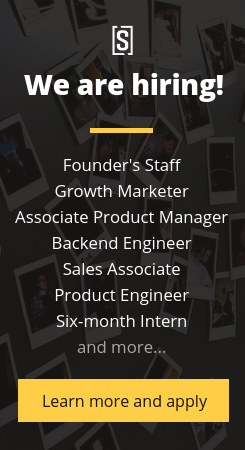 We’re always looking for new team members and interns. Think you’d be a good fit? Check out our open positions here.